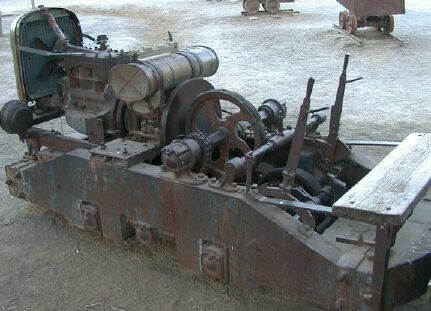 This gasoline powered mine engine is on display at the Furnace Creek Ranch Borax Museum in Death Valley National Park. 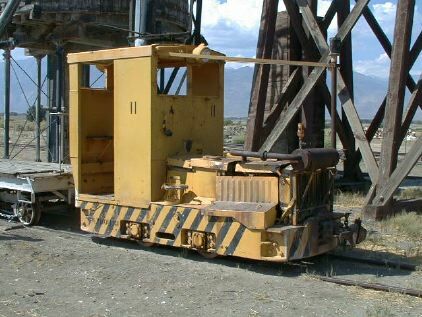 The mine locomotive was used in the Ryan mines around 1922. The most interesting feature of the Plymouth gasoline powered locomotive is the friction clutch/continuously variable transmission. As the wooden rimmed clutch wheel was moved from side to side, it would change the speed or direction of the locomotive. This gas powered Plymouth industrial loco is located at the Laws Railroad Museum at Laws California (4 miles NE of Bishop CA). This little engine appears to be functional and may be used to move equipment around the museum grounds.